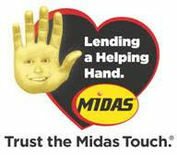 MIDAS has teamed up with Pope to offer the band a great fundraising opportunity. In addition, you will also receive a $15.00 discount on a second service. (i.e. a second oil change could cost you as little as $12.99!!!) What a BARGIN!!! EVERY DOLLAR GOES TO THE BAND PROGRAM. Get one for every car in the family!!! How do you purchase yours? Just send your check, made payable to PBPA, into the white box located inside the band room. $20.00 for each card you wish to purchase. Be sure to write "MIDAS" both on the outside of the envelope and on the memo line of your check. We will send the card home with your student. Up to 6 quarts Conventional 5w20-30 oil. Tire Rotation Visual Brake Inspection. This fundraising effort cannot be used with any other discounts. Discounts received from this fundraiser are off full retail priced services. Offer EXCLUDES tires and batteries. Only participations locations will honor this offer. Visit midaspromos.com for participation locations.